Background: Surgical and transcatheter bioprosthetic valves (BPVs) in the pulmonary position in patients with congenital heart disease may ultimately fail and undergo transcatheter reintervention. Angiographic assessment of the mechanism of BPV failure has not been previously described. Aims: The aim of this study was to determine the mode of BPV failure (stenosis/regurgitation) requiring transcatheter reintervention and to describe the angiographic characteristics of the failed BPVs and report the types and efficacy of reinterventions. Materials and Methods: This is a retrospective single-center review of consecutive patients who previously underwent pulmonary BPV placement. (surgical or transcatheter) and subsequently underwent percutaneous reintervention from 2005 to 2014. Results: Fifty-five patients with surgical. (41) and transcutaneous pulmonary valve. 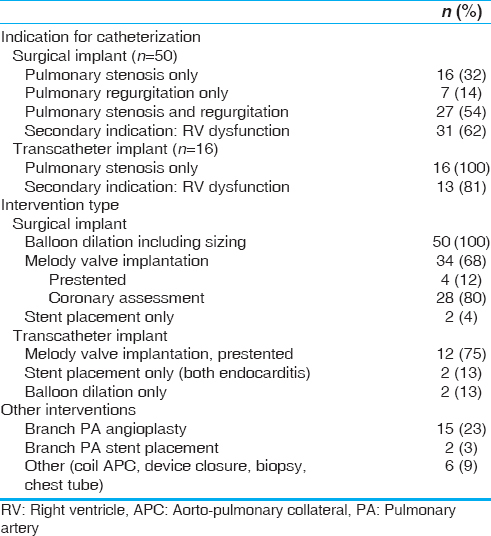 (TPV) (14) implantation of BPVs underwent 66 catheter reinterventions. The surgically implanted valves underwent fifty reinterventions for indications including 16 for stenosis, seven for regurgitation, and 27 for both, predominantly associated with leaflet immobility, calcification, and thickening. Among TPVs, pulmonary stenosis. 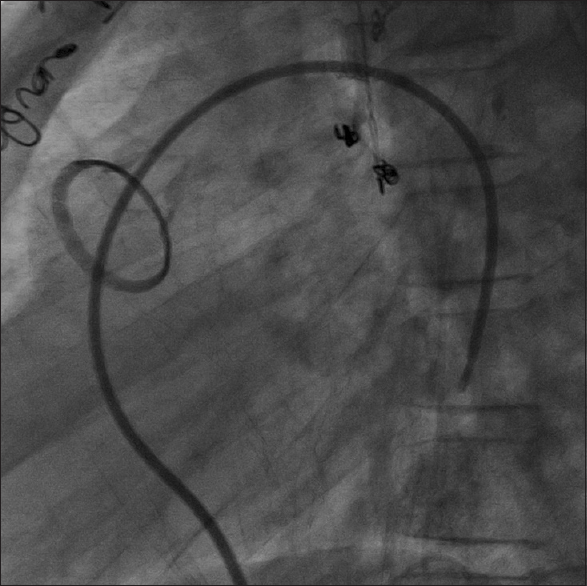 (PS) was the exclusive failure mode, mainly due to loss of stent integrity. (10) and endocarditis. (4). Following reintervention, there was a reduction of right ventricular outflow tract gradient from 43 ± 16 mmHg to 16 ± 10. mmHg (P < 0.001) and RVp/AO ratio from 0.8 ± 0.2 to 0.5 ± 0.2 (P < 0.001). Reintervention with TPV placement was performed in 45. (82%) patients. (34 surgical, 11 transcatheter) with no significant postintervention regurgitation or paravalvular leak. Conclusion: Failing surgically implanted BPVs demonstrate leaflet calcification, thickness, and immobility leading to PS and/or regurgitation while the mechanism of TPV failure in the short- to mid-term is stenosis, mainly from loss of stent integrity. This can be effectively treated with a catheter.based approach, predominantly with the valve-in-valve technique. Recently, reports of life-threatening aortic stenosis from accelerated degeneration of Mitroflow BPVs in the aortic position in pediatric patients have prompted investigations of BPV use in children in the pulmonary position., At our center, most patients with BPV failure are referred for catheterization before surgical referral. Thus, we have the opportunity to acquire information about the hemodynamic function and integrity of the Mitroflow valve as well as other BPVs in the pulmonary position. The literature has not focused on the angiographic appearance of failed BPVs. Hence, our primary goal is to describe the mechanism of failure of various BPVs in the pulmonary position through hemodynamic and angiographic assessment in the catheterization laboratory. This, along with the types and efficacy of catheterization reintervention, will be presented. We performed a single-center retrospective chart review as approved by the Institutional Review Board on all consecutive patients who underwent transcatheter reintervention of surgically or transcatheter-implanted BPVs in the pulmonary position between 2005 and 2014. Data collection involved review of medical records including all catheterization reports, surgical operative notes, transthoracic echocardiography (TTE) reports, cardiac magnetic resonance (CMR) reports, and catheterization angiograms. Variables collected included patient demographics, primary diagnosis, valve type, and precatheterization TTE and CMR data, if available. Catheterization data included indication, pre-/post-intervention hemodynamics including RVOT gradient, right ventricle systolic pressure (RVSP), and right ventricle: aortic pressure ratio (RVp/AO), interventions performed, adverse events, and occurrence and timing of future transcatheter or surgical reintervention. Fluoroscopic and angiographic appearance of the valves were reviewed by a single reader and assessed using a grading scale that was created based on a modification of previously described echocardiography criteria. The degree of leaflet calcification, thickness, and mobility were graded as follows: grading of leaflet calcification: 0 (no calcification), 1 (partial involvement of 1 leaflet), 2 (partial involvement of 2 or 3 leaflets), 3 (involvement of 1 leaflet), and 4 (complete involvement of 2 or 3 leaflets). Grading of leaflet thickness: 0 (normal leaflet thickness), 1 (mild thickness, <2 mm of 1 leaflet), 2 (mild thickness of 2 or 3 leaflets), 3 (marked ≥2 mm thickness of 1 leaflet), and 4 (marked thickness of 2 or 3 leaflets). Grading of leaflet immobility: 0 (normal leaflet opening), 1 (mild restriction of 1 leaflet), 2 (mild restriction of 2 or 3 leaflets), 3 (marked restriction of 1 leaflet), and 4 (marked restriction of 2 or 3 leaflets). The location of the balloon waist in relation to the valve-sewing ring during balloon sizing/angioplasty was documented. Transcutaneous pulmonary valves (TPVs) were further assessed for stent integrity, including fractures, compression, and luminal compromise. Data were reported as median (range), frequency (percentage), or mean ± standard deviation. Analysis of variables pre-/post-reintervention and between a heterogeneous group of Carpentier-Edwards (CE) (Edwards Lifesciences, Irvine, California, USA) bovine pericardial valves and Mitroflow A12/LX (Sorin S.p.A., Milan, Italy) valves was performed using Student's t-test or Wilcoxon rank-sum test, when appropriate. The strength of association between grading scale variables was assessed using Spearman's correlation coefficient. P < 0.05 was considered to be statistically significant. For patients with multiple catheterizations on the same valve, the data from the first procedure were used for analysis. Fifty-five patients after surgical (41) or transcatheter (14) implantation of BPVs underwent 66 catheterization reinterventions during the study period. Their demographic and BPV information is summarized in [Table 1] and [Table 2]. 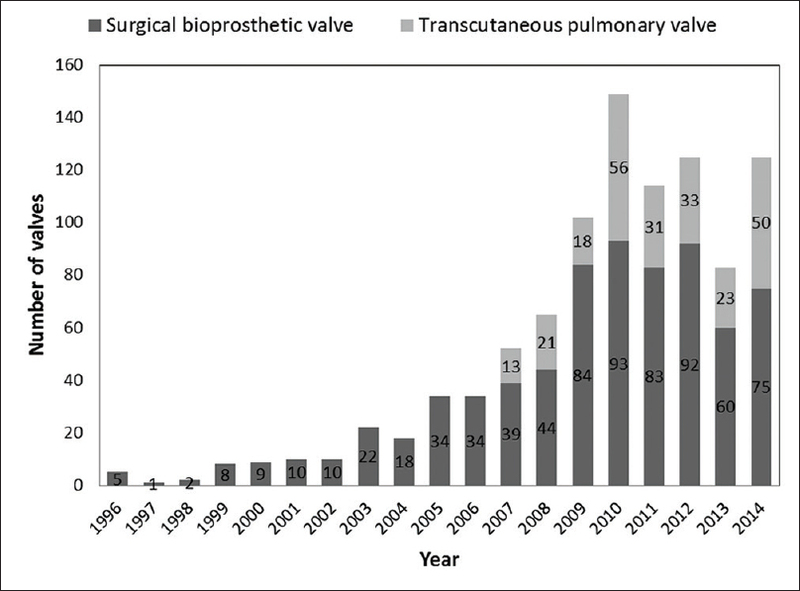 Since 1996, 723 BPVs were surgically placed at our center in the pulmonary position including 230 CE bovine pericardial valves and 319 Mitroflow valves [Figure 1]. Since 2007, 245 TPVs (Melody, Medtronic Inc., Minneapolis, MN, USA) were implanted in the pulmonary position with an incidence of catheterization reintervention of 6.1%. This is comparable to the estimated incidence of catheter-based reinterventions at our center on surgically placed valves during the same time period of 6.3%. Most patients underwent precatheterization noninvasive imaging including TTE (92%) and/or CMR (36%) and the results of these tests are summarized in [Table 3]. By TTE, the median RVOT peak gradient was 55 mmHg (21–93) and 65% of patients had at least moderate PR. No TPV patients had more than mild PR by echo or CMR. 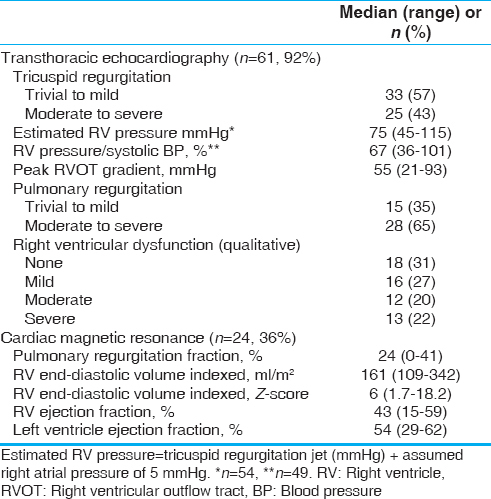 Most patients had at least mild RV dysfunction by echo (69%), with a median RV ejection fraction of 43% (15–59) by CMR. In the surgical group, the indication for catheter reintervention was SVD represented as only PS (16; 32%), only PR (at least moderate) (7; 14%), or both (27; 54%) [Table 4]. The median RVOT gradient, RVSP, and RVp/AO were 38 mmHg (11–75), 70 mmHg (40–140), and 0.77 (0.41–1.14), respectively. Fluoroscopic and angiographic assessment found the evidence of leaflet calcification, thickness, and immobility with mean severity grades of 1.67 ± 1.23, 2.04 ± 1.38, and 3.35 ± 1, respectively [Figure 2] and [Table 5]. The median grades for leaflet calcification, thickness, and immobility were 2, 2, and 4, respectively. The calcification, when present, was most apparent at the leaflet tips, the leaflet cusps, and occasionally involved the commissures [Figure 3]. Further assessment of the Mitroflow valves found that the immobile leaflets appeared to freeze in the partially open position with the leaflet tips being the primary level of obstruction. This yielded a supravalvar balloon waist at this location, necessitating a more distal TPV placement in relation to the sewing ring [Figure 4]. Some Mitroflow valves had infolding/crowding of posts (leaflet suture lines) contributing to the obstruction. Finally and not unexpectedly, the sewing ring was not expandable by the balloons (typically not high pressure) used during interventions. Regarding the CE bovine pericardial valves, the leaflets were not as easily identifiable by fluoroscopy and angiography. This was particularly true in the older valves with free insufficiency. The visualized immobile leaflets were typically partially open or in the closed position with the waist of the balloon typically just above the ring. Balloon dilation, in some instances expanded the posts, but not the ring, typically with recoil of the posts. Among this cohort of patients, the Mitroflow A12/LX valves as compared to the CE bovine pericardial valves had a higher mean grade of leaflet thickness (P < 0.001) and leaflet immobility (P = 0.04) [Table 5]. A higher grade of leaflet calcification (r = 0.409, P = 0.01) or leaflet thickness (r = 0.827, P < 0.001) correlated with a higher grade of leaflet immobility. 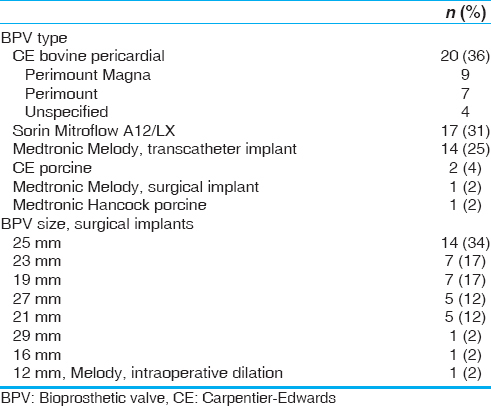 All interventions (n = 50) included balloon dilation and/or balloon sizing of the bioprosthetic valve, followed most commonly by TPV implantation (n = 34; 68%), four of which were prestented [Table 4]. Prestenting was performed to relieve a subvalvar obstruction (1), prevent recoil of thick leaflets and valve posts to optimize TPV landing zone (2) and resolve an acute angle from valve location in distal RVOT (1). Stent placement only was also used to manage obstruction to the pulmonary arteries from a distally placed bioprosthetic valve [Figure 5]. Of note, the frequency of use of TPV increased from 30% to 74% following its approval for dysfunctional conduits in 2010. The patients with TPVs underwent re-catheterization at a median of 2 years (0.7–5) exclusively due to PS. The two mechanisms of PS in these patients were loss of stent integrity (10), and endocarditis (4) [Table 4]. None of the patients with valve fracture had undergone prestenting during their initial implantation. The mean RVOT gradient, RVSP, and RVp/AO were 50 mmHg (30–80), 78 mmHg (55–110), and 0.9 (0.5–1.1), respectively. Narrowing of the stents leading to obstruction with or without fracture demonstrated anterior/posterior narrowing with at times further dynamic compression and loss of luminal integrity. Valves with endocarditis demonstrated severe stent stenosis due to circumferential filling defect. One patient with endocarditis had visibly thickened (Grade 2), immobile (Grade 4) leaflets without calcification. Another patient had a TPV within a 16 mm bioprosthetic valve (13-year-old, body surface area of 1.46 m 2) with a balloon waist localized at the valve ring that did not significantly resolve the gradient, suggesting inadequate effective orifice area for patient size (i.e., patient–prosthetic mismatch). Interventions included additional TPV implantation following prestenting (12), stent placement only (2), or balloon angioplasty only (2) [Table 4]. Following intervention on the surgical and transcatheter valves, there was an overall reduction of the RVOT gradient from 43 ± 16 mmHg to 16 ± 10 mmHg (P < 0.001), RVSP from 76 ± 20 mmHg to 52 ± 13 mmHg (P < 0.001), and RVp/AO ratio from 0.8 ± 0.2 to 0.5 ± 0.2 (P < 0.001) as well as an increase in cardiac index when measured from 2.9 ± 0.6 L/min/m 2 to 3.5 ± 0.8 L/min/m 2 (P < 0.001). There was no angiographic evidence of more than trivial PR or paravalvular leak in patients who underwent TPV implantation (n = 45). Following catheter reintervention, nine patients with surgically placed BPVs underwent an additional transcatheter reintervention at 2.6 years (0.2–5.75). Eight of these patients subsequently had TPV implantation. Following TPV implantation in the surgical bioprosthetic valve group, freedom from reintervention or death was 94% (32/34 patients) at a median follow-up of 1.3 years (0–6.1). Eight out of total 55 patients underwent surgical reintervention, three within a week of catheterization in the patients with endocarditis. One patient had balloon angioplasty only of the bioprosthetic valve prior to scheduled surgery the following day. The remaining four patients had surgical pulmonary valve replacement at 2.4 years (0.1–5.1) postinitial catheterization intervention. In the entire cohort, there were two deaths in follow-up, both unrelated to the cath procedure. There were 19 adverse events during 16 of the 66 (24%) catheterizations; most commonly rebleed postcatheterization without the need for transfusion (6, 32%) and transient rhythm disturbances (4, 21%). The most serious event was a distal pulmonary artery (PA) tear requiring coil embolization of a segmental branch secondary to wire injury. There were no instances of coronary compression. Our study characterized BPV failure in the pulmonary position using catheterization hemodynamics and angiographic appearance among patients referred for reintervention; further, we described the type and efficacy of the reintervention. Our recent awareness of accelerated structural valve degeneration in Mitroflow BPVs in the aortic position served as the precipitant of this investigation though we chose to broaden our review to all types of BPVs utilized in the pulmonary position. The mechanism of failure exhibited by BPVs implanted surgically versus TPV was distinct. Surgical valves demonstrated leaflet failure causing stenosis and/or regurgitation while TPVs had stent failure or endocarditis leading to PS only. There was no TPV leaflet failure in the absence of stent fracture or endocarditis. The surgical BPVs demonstrated leaflet calcification, thickening, and immobility, with the latter being the most striking finding. Furthermore, we found that higher grades of calcification and thickening were associated with higher grades of immobility, suggesting changes to the biomaterial of the valve are what lead to its mechanical dysfunction. The angiographic appearance of failed BPVs in our study is consistent with those described by Butany et al. 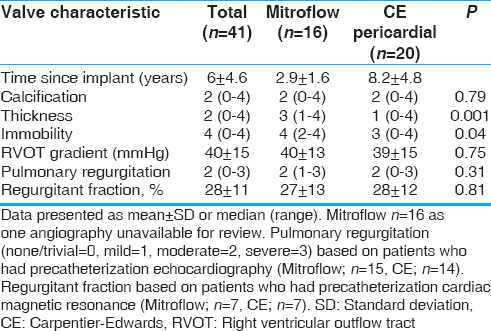 in two separate reviews of a limited number of surgically explanted CE Perimount and Mitroflow A12 valves., Further, when comparing the Mitroflow A12/LX and a heterogeneous group of CE bovine pericardial valves in our cohort, the Mitroflow BPVs had higher grades of leaflet thickness and immobility. This finding of Mitroflow leaflet thickening in the pulmonary position is consistent with the progressive leaflet thickening seen in failed Mitroflow valves in the aortic position.,, It is suggested that the lack of antimineralization techniques in the preparation of the original Mitroflow valves has contributed to their dysfunction; something the new Mitroflow DL valves aim to avoid. Patient factors may also contribute to valve failure. For instance, a patient–prosthetic mismatch creates undue turbulence through the orifice leading to an inadequate effective orifice not only through the sewing ring, but also as SVD develops, exacerbating the stenosis., Further, SVD may also result from distal placement of the valve in the RVOT, which can cause crowding of the posts, decrease in leaflet excursion, and/or obstruction to the pulmonary arteries. 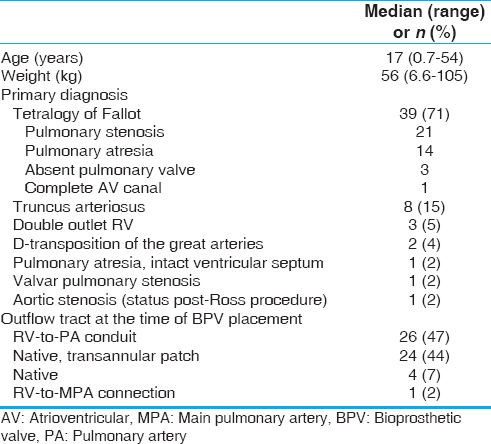 From a clinical standpoint, this study demonstrates the potential utility of the angiographic assessment of surgical BPVs as another modality in the evaluation of BPV dysfunction. Specifically, in the absence of intracardiac echocardiography and/or inadequate imaging from other modalities, for instance, the angiographic appearance of the valve paired with the hemodynamic data can provide a thorough assessment of BPVs. The acquired data may assist in decision-making regarding the need and type of surgical or transcatheter reintervention. In our cohort, there were no TPVs that demonstrated pure leaflet dysfunction and angiographic degenerative changes with an intact stent and no endocarditis. Ten patients in this study, who were part of the early experience in the investigational device exemption trial, lost their stent integrity due to inadequate conduit rehabilitation including prestenting. This TPV failure, reported by McElhinney et al. in 2011, has decreased in association with change in implantation techniques. It will thus be interesting to observe how the TPV performs in a long term and whether the leaflets will ultimately demonstrate angiographic findings similar to the surgical BPVs. The remaining four TPVs in our cohort had IE with an in-stent circumferential filling defect assumed to be vegetation or thrombus formation. Three of the four patients with endocarditis were palliated with catheter-based reinterventions in an effort to reduce the severity of the RVOT obstruction and RVSP to lower the risk of surgery. The true incidence of IE is unknown partly due to inconsistent definitions and reporting rates. McElhinney et al. reported the incidence of definite or presumed IE in 311 patients following Melody valve implantation to be 5%. According to Buber et al., whose single-center experience had a bacterial bloodstream infection incidence of 9.5%, determined patients with previous bloodstream infections, higher mean RVOT gradients or RVOT wall irregularities may be associated with an increased incidence of the said infections. The most commonly used reintervention in our study was TPV implantation which reduces the stenosis and resolves the regurgitation as long as the effective orifice area is appropriate for the patient. Prestenting is typically unnecessary using this valve-in-valve technique. The success and technical aspects of this approach in the pulmonary position were demonstrated by Gillespie et al. in 2012 with excellent short-term outcomes. Their study, which included 104 patients, 38 CE bovine pericardial valves, 38 Medtronic Hancock conduits, 3 Mitroflow valves, and 25 others, reported a freedom from reintervention of 92% ±5% at 2 years. Ongoing follow-up is needed to determine the long-term durability of the TPVs using this implantation technique. Furthermore, studies with larger sample sizes are needed to compare the incidence of failure of the different types of BPVs in the pulmonary position. This was a single-center, retrospective study with a small sample size and a short follow-up time. This is a highly selected population since inclusion criteria limited the population to those not only referred to catheterization, but who also underwent a transcatheter intervention. Because this is a retrospective study, there were no predefined criteria for referral to catheterization or for standardizing when an intervention or reintervention was carried out. Furthermore, because the study period overlaps the time before and after the Melody valve was available, older valves may have been referred for catheterization relatively later. Additional interventions performed during the same procedure, such as branch PA angioplasty, may have assisted in reducing the RVSP and RVp/AO ratio making the RV-to-PA gradient in certain cases a more reliable estimate of success. Failing BPVs in the pulmonary position demonstrate increased leaflet calcification, thickness, and immobility leading to both PS and regurgitation as assessed by catheterization and angiography. The Mitroflow A12/LX BPVs as compared to a heterogeneous group of CE bovine pericardial valves tend to have more severe leaflet thickness and leaflet immobility. Failing surgically and transcatheter-implanted valves can be effectively treated with a catheter-based approach, predominantly with the valve-in-valve technique. Lee C, Park CS, Lee CH, Kwak JG, Kim SJ, Shim WS, et al. Durability of bioprosthetic valves in the pulmonary position: Long-term follow-up of 181 implants in patients with congenital heart disease. J Thorac Cardiovasc Surg 2011;142:351-8. Jang W, Kim YJ, Choi K, Lim HG, Kim WH, Lee JR. Mid-term results of bioprosthetic pulmonary valve replacement in pulmonary regurgitation after tetralogy of Fallot repair. Eur J Cardiothorac Surg 2012;42:e1-8. Chen PC, Sager MS, Zurakowski D, Pigula FA, Baird CW, Mayer JE Jr., et al. Younger age and valve oversizing are predictors of structural valve deterioration after pulmonary valve replacement in patients with tetralogy of Fallot. J Thorac Cardiovasc Surg 2012;143:352-60. Saleeb SF, Newburger JW, Geva T, Baird CW, Gauvreau K, Padera RF, et al. Accelerated degeneration of a bovine pericardial bioprosthetic aortic valve in children and young adults. Circulation 2014;130:51-60. Soor GS, Leong SW, Butany J, Shapero JL, Williams WG. Pulmonary site bioprostheses: Morphologic findings in 40 cases. Arch Pathol Lab Med 2009;133:797-802. Butany J, Feng T, Luk A, Law K, Suri R, Nair V. Modes of failure in explanted mitroflow pericardial valves. Ann Thorac Surg 2011;92:1621-7. Flameng W, Rega F, Vercalsteren M, Herijgers P, Meuris B. Antimineralization treatment and patient-prosthesis mismatch are major determinants of the onset and incidence of structural valve degeneration in bioprosthetic heart valves. J Thorac Cardiovasc Surg 2014;147:1219-24. Zubairi R, Malik S, Jaquiss RD, Imamura M, Gossett J, Morrow WR. Risk factors for prosthesis failure in pulmonary valve replacement. Ann Thorac Surg 2011;91:561-5. Carpentier A. Hemodynamic factors affecting the fate of valvular bioprosthesis. Circulation 2010;121:2083-4. Flameng W, Meuris B, Yperman J, De Visscher G, Herijgers P, Verbeken E. Factors influencing calcification of cardiac bioprostheses in adolescent sheep. J Thorac Cardiovasc Surg 2006;132:89-98. Flameng W, Herregods MC, Vercalsteren M, Herijgers P, Bogaerts K, Meuris B. Prosthesis-patient mismatch predicts structural valve degeneration in bioprosthetic heart valves. Circulation 2010;121:2123-9. Waller BF, McKay C, Van Tassel J, Allen M. Catheter balloon valvuloplasty of stenotic porcine bioprosthetic valves: Part I: Anatomic considerations. Clin Cardiol 1991;14:686-91. Sénage T, Le Tourneau T, Foucher Y, Pattier S, Cueff C, Michel M, et al. Early structural valve deterioration of Mitroflow aortic bioprosthesis: Mode, incidence, and impact on outcome in a large cohort of patients. Circulation 2014;130:2012-20. Esch JJ, Bergersen L, McElhinney DB, Porras D, Lock JE, Marshall AC. Wire-related pulmonary artery injury during pediatric and adult congenital interventional cardiac catheterization. Congenit Heart Dis 2013;8:296-301. Butany J, Nair V, Leong SW, Soor GS, Feindel C. Carpentier-Edwards Perimount valves – Morphological findings in surgical explants. J Card Surg 2007;22:7-12. Gillespie MJ, Rome JJ, Levi DS, Williams RJ, Rhodes JF, Cheatham JP, et al. Melody valve implant within failed bioprosthetic valves in the pulmonary position: A multicenter experience. Circ Cardiovasc Interv 2012;5:862-70. McElhinney DB, Cheatham JP, Jones TK, Lock JE, Vincent JA, Zahn EM, et al. Stent fracture, valve dysfunction, and right ventricular outflow tract reintervention after transcatheter pulmonary valve implantation: Patient-related and procedural risk factors in the US Melody Valve Trial. Circ Cardiovasc Interv 2011;4:602-14. McElhinney DB, Benson LN, Eicken A, Kreutzer J, Padera RF, Zahn EM. Infective endocarditis after transcatheter pulmonary valve replacement using the Melody valve: Combined results of 3 prospective North American and European studies. Circ Cardiovasc Interv 2013;6:292-300. Buber J, Bergersen L, Lock JE, Gauvreau K, Esch JJ, Landzberg MJ, et al. Bloodstream infections occurring in patients with percutaneously implanted bioprosthetic pulmonary valve: A single-center experience. Circ Cardiovasc Interv 2013;6:301-10.